I'm writing a conditional in the Field Calculator and it's giving me an error of syntax in line 2. Can someone see it? The syntax error will be due to your greater than or equal to being written back-to-front. Should be >= not =>. Also I think you want to test that 10 is greater than and not less than here. Occasionally python doesn't like to handle if: return, elif: return, elif: return etc., so I like to put a single return at the end. Also, as math.fabs() returns an absolute value, so there's no need to check that the value is not negative. 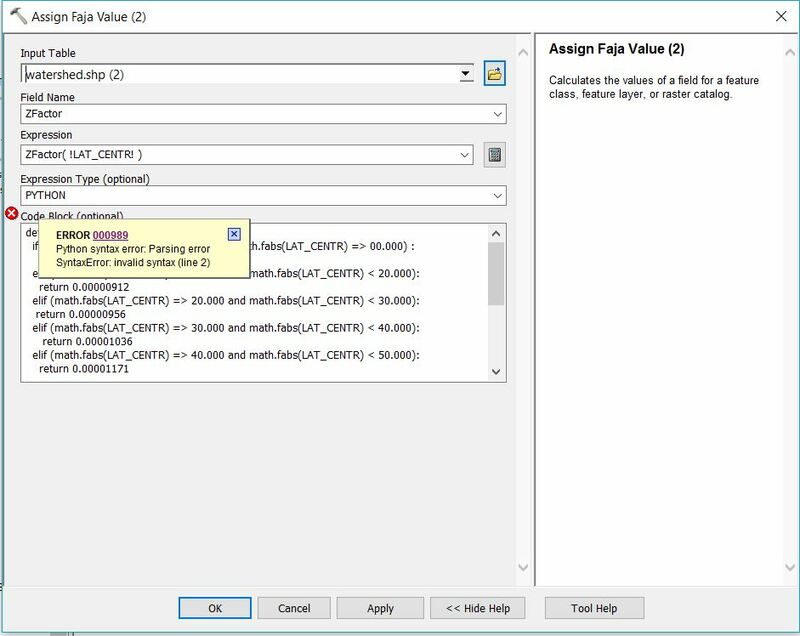 math.fabs(LAT_CENTR) is moved out of the if statement to eliminate redundant calculations of the same value. Depending on the distribution of that value, an average of 10 calculations per function call. Since the lower bound for each elif has already been tested in the previous test, you don't need to test for it in the next. I'm guessing at what you were trying to do in the opening if statement; as written it is logically impossible, or always false. An absolute value will always be greater than zero, so a compound test there is not necessary either. Not the answer you're looking for? Browse other questions tagged arcgis-desktop field-calculator python-parser syntaxerror or ask your own question.